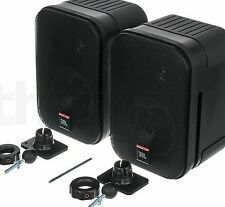 You are purchasing one speaker for the buy it now price. They have all been tested and sound great. Buy 1 or all 4! Great professional speakers. 200 mm (8") Kevlar cone woofer, 25 mm (1") titanium diaphragm compression driver. JBL Northridge E Series EC35 Center Channel. Condition is Used. Sounds excellent speaker is over all Excellent condition the centers appear to be replaced probably do to being push in dual voice coil ..if you have any questions let me know speaker weight is 25 it's an awesome sounding center speaker .ShippedSPS Priority Mail. The pair ofJBL 9300 2-Way Passive Cinema Surround Loudspeakers feature a 1" HF horn and 10" woofer. The loudspeaker uses a wave shaping vane which distributes acoustic energy in proper proportion to the room. JBL Northridge Series speakers are renown for their excellent fidelity. The E10 is a compact bookshelf speaker (10 1/8"W x 10 1/8"H x 5"D). Can be used as a main speaker or as a surround speaker with its built in hanging brackets. JBL G Cinema Passive Subwoofer Pre owned in good condition 100% working tested Only issue is the dented dust cap, does not affect sound quality. Has some light scratches. Please see pics. Thank you for viewing. Pendant Subwoofer with Crossover. Standalone Hookup Connect to Input connector; built-in low-pass filter permanently engaged. Net Weight 7.6 kg (16.7 lb). 369 mm (14.5 in) to top of suspension bracket. High Definition Imaging (HDI) waveguide technology takes its cues from the legendary JBL M2 Master Reference Monitor. Contemporary cabinet shape with angled side and top panels provide a sophisticated, modern look. Trending at $198.74eBay determines this price through a machine learned model of the product's sale prices within the last 90 days. 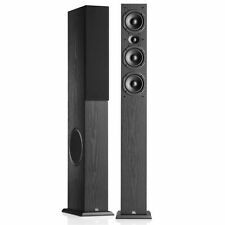 JBL Studio Series S Center II Studio Series 3 Way Center Channel Speaker. Condition is Used. Shipped with USPS Priority Mail. ACTUAL PHOTOS. Please see photographs for exact condition. I am an individual who takes pride in my listings. I strive to describe details to the best of my knowledge. I ship the next business day. I am easy to work with, so please email me with any questions before buying. Thanks for supporting small business. Please check my store for more great deals! 5.25" Polypropylene Woofer. Minimum Frequency Response 80 Hz. Maximum Frequency Response 17 kHz. PMPO Output Power 150 W.
2.5kHz crossover. High Definition Imaging (HDI) Waveguide: The JBL Arena 120 bookshelf loudspeaker's tweeter incorporates a High Definition Imaging (HDI) Waveguide. This High Definition Imaging (HDI) waveguide technology takes its cues from the legendary JBL M2 Master Reference Monitor. Your high-definition, flat-panel TV displays video beautifully and flawlessly. But ask yourself this: How does it sound?. The JBL Cinema SB200 gives you superlative JBL sound that is heard in movie theaters throughout the world - without compromising space and style. Sound great & in pristine condition. See last photo. Otherwise perfect. Trending at $68.74eBay determines this price through a machine learned model of the product's sale prices within the last 90 days. You could do better and you could do worse at this price range so just do what feels right to you. Nice sounding albeit flawed JBL LX 300's- if sound is more important that looks then these are for you - Review the pictures and be sure the cracks in tweeter faceplate, dings in the dust cap and screen quality are up to par for application. > Weight 8 1/2 lbs. > Nominal impedance: 8 Ohms. Subwoofer enclosures are not covered by Techronics' warranty. Burnt voice coils. Put the completed RMA FORM inside the box with your item. We areNOT responsible for any custom duties or brokerage fees that may apply for all international orders. 2 Way Bookshelf Loudspeakers. Speaker System. light normal surface scuffs, scratches & light dust. made in the USA. We can only describe what we see and what we know. approx 17 lbs in weight each. SEE PICTURES FOR MORE DETAILS. Approved by Lucasfilm, Ltd. for THX installation.". Per JBL spec sheet. Subwoofer enclosures are not covered by Techronics' warranty. Burnt voice coils. Put the completed RMA FORM inside the box with your item. All products are covered by Techronics ' warranty. US Residents. Chipped paint on the speaker (see pictures 7-9), it does not affect working condition! You will get what is shown on the pictures. Not Included. 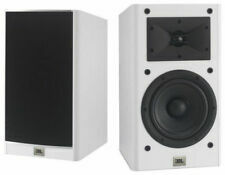 JBL Loft 50 Three-Way Floorstanding Loudspeaker (Pair). For those who possess a contemporary taste in décor and an affinity for performance speakers, the JBL Loft series is the perfect hybrid solution. Multi-angle enclosure for flexibility - use EON1500 as a main PA speaker or floor monitor. 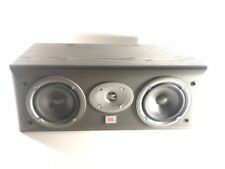 These JBL speakers are used and in fair working condition. One speaker has a large scratch across the front. 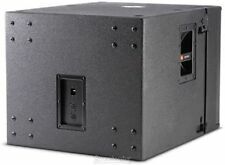 The JBL Mucic1 series Passive Subwoofer can add extended base to your room without the cost of a powered subwoofer. 18" 800 Watt Passive Flyable Subwoofer. LF Driver : 1 x JBL 2268H 457 mm (18 in) Differential Drive woofer. Enclosure : Rectangular, 18 mm, 13-ply birch plywood. Input Connectors : Neutrik® Speakon® NL-4 (x2). Dual 165mm (6-1/2") Floorstanding Loudspeaker with High-Frequency Compression Driver in a Horn and Classic JBL® Bass. Now JBL Studio 5 Series speakers, acoustically designed by renowned JBL chief engineer Greg Timbers, continue this performance-proven tradition. The included wall-mount bracket enables the unit to be secured against a wall or other flat surface. It features magnetically shielded transducers for near monitor or ear TV applications. Professional drivers and high-quality crossover gives a faithful and transparent sonic performance. This item is in good usable condition. You are purchasing just the one speaker. Amplified soundbar speaker. HARMAN Display Surround technology creates a surround-type experience from two channels. 120 watts max. system power. optical cable and analog stereo cable included. It is important that you provide us with 2 valid phone numbers. Pair JBL 2500 2-Way Bookshelf Speakers w/Titanium tweeters Frequency Responses 90 Hz - 23 kHz Impedance 8 ohm Sensitivity 88 dB Very good condition. They sound great and look great! **We have 2 pairs of these for sale. This listing is for 1 pair. 10" (250mm) fiberglass/Kevlar cone LF woofer, with neodymium magnet coaxial 5" (125mm) anodized aluminum cone MR, and 1" (25mm) titanium diaphragm compression driver. High Frequency Driver 1" (25 mm) compression driver, pure titanium diaphragm with patented JBL diamond surround. Part Number: CSS8004. 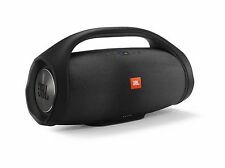 JBL PROFESSIONAL by Harman. High sensitivity across the product line provides maximum sound level, even at low tap settings. Manufacturer: Harman. Ceiling Speaker. The sale is for the speaker & screw kit, only. ®1 Pro features a professional crossover network coupled with professional drivers making it ideal for even the most demanding near-field audio applications. The included wall- mount bracket enables the unit to be secured against a wall or other flat surface. Overload Protection Full-range power limiting to protect network and transducers. JBL’s exclusive SonicGuard™ overload protection allows higher operational levels and improved. In-Ceiling Subwoofer. Nominal Sensitivity 95 dB SPL, 1W @ 1 m (3.3 ft) in ceiling near corner (π/2) 89 dB SPL, 1W @ 1 m (3.3 ft) in center of ceiling (2π). Proven acoustic superiority through rigorous testing and real-world evaluation. •Intended for Use with JBL Arena Series. •Model: JBL ARENA170BK. Tight, extended bass response optimized for show-stopping listening, whether for movies, TV, music or console gaming. 12" 800 Watt 2-Way Passive Line-Array Loudpeaker. JBL’s exclusive neodymium magnet Differential Drive® woofer for high-power capacity and light-weight. VRX932LA-1 features 3 x 2408J Annular Ring Diaphragm HF drivers. Rated Maximum SPL 115 dB @ 1 m (3.3 ft) in ceiling near corner (π/2). Suitable for use in air handling spaces, per U.L.-2043, U.L.-1480, NFPA90, NFPA70A. Low Frequency 200 mm (8.0 in) Polypropelene cone. JBL 2500 Bookshelf Speakers Pair- 2 Way Titanium Tweeters. Condition is Used. Shipped with USPS Priority Mail. Wood has been covered witha type of texture paint. System Polarity Woofer (IEC), HF (JBL). System Input Type Banana. High Frequency 2414H-1. Low Frequency 610H. Crossover Frequencies 2800Hz. Minimum Impedance 7Ω @ 200Hz. Rated Impedance 8 Ω. Maximum dB SPL 120 dB continuous, 126 dB peak.